Aurora, IL – Richards-Wilcox manufactures a line of specialty hardware products for the antique reproduction market (circa 1880 through 1950). Many different types of decorative hinges, hinge straps, cast iron handrail brackets, and antique flat track and trucks are available for historic preservation applications such as landmark buildings, roundhouses, barns, stables, and coach houses. Finish options include special antique powder coat paint in a crackled pewter, crackled bronze, and black iron finish. There are also plating options such as zinc plating, zinc chromate, hot dipped zinc, stainless steel, and powder paint. All hardware is warranted for 10 years and is available on a quick ship program. Richards-Wilcox has been designing and manufacturing the same premium quality heavy-duty industrial hardware since 1880. 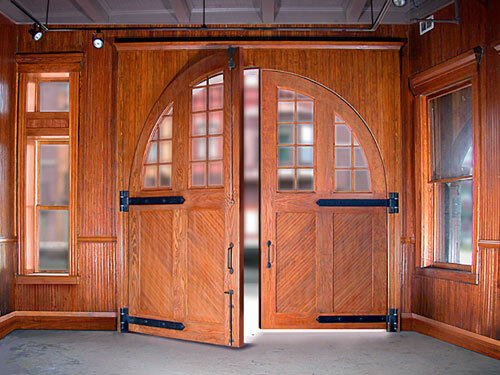 Our support services include design assistance and special laser fabrication of unique door hardware parts. For more information contact Richards-Wilcox at our toll free number 800-877-8456.